Finally we had our first "friend-guest" aboard Starship (not including Busby since he was a part of the crew, not a guest), Anne-Marie's friend from University, Crystal. It was great that she was able to accommodate our schedule (or lack thereof), purchasing a ticket to Savusavu with only five days notice. Fortunately she currently lives in Australia, something we plan to take advantage of soon, so the flight was not too long. Crystal was just in time to help us celebrate my 30th birthday with our good friends from Lolo. Anne-Marie really went crazy with the decorations, and made it a very special event! In fact it was a three day event, we had the party on Sept 6th, I got special treatment on the 7th, and then since we are across the international dateline, it was my birthday in Canada on the 8th. It was one birthday that I will certainly never forget! The only thing which could have made it even better is if our families had been there, but they sent along their warm wishes via email and Skype which was much appreciated. The day after my party, we parted ways with Lolo and headed for Viani Bay, about 45 miles to the east of Savusavu. A strong south wind allowed us to sail there at great speed and relative comfort. 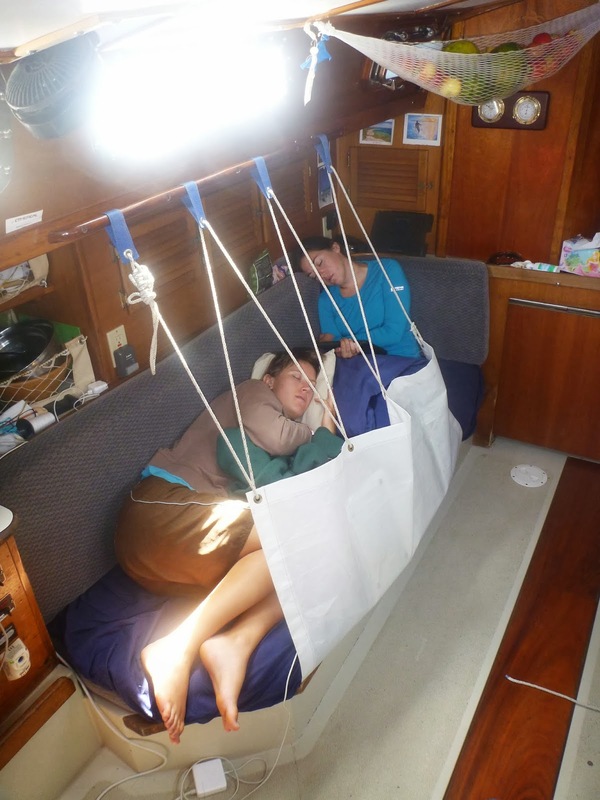 Crystal seemed to take pretty well to the sailing for her first time, enjoying some snuggle time in the lee cloth with Anne-Marie. Viani Bay is a beautiful, large bay. We found protection from the chop in the north east corner of the bay with several other yachts. The bottom was pretty dense with coral unfortunately, but I deployed our chain buoying system to keep us clear of it and swinging free. Viani Bay is famous for a local Fijian named Jack Fisher, who takes yachties on excursions around the bay for only ~5 USD/person. One day we teamed up with the other boats in Viani to go snorkeling with Jack at a place called "The Cabbage Patch" and a couple other stops. The vessel Seagoing was our platform for this excursion, being the biggest of the yachts in Viani Bay at the time. Thank you Seagoing! The snorkeling was really top notch, probably now second or third on our top snorkeling spots list, next to Fakarava South and Koro island. The next day Jack guided us and another boat, Evergreen, on a spear fishing excursion with our dinghies. As we kept driving our dinghies further and further away from land towards the reef, we began to worry about our low fuel level. In our haste to depart we forgot to check, and the tank was now on empty! Luckily our outboard engine is a 4 stroke and sips gasoline very slowly, allowing us to make it back to the boat afterwards with plenty to spare. The spearfishing was a lot of fun, and the girls enjoyed the snorkeling, but alas it was not fruitful. Crystal finally had the turtle spotting she was hoping for though! Think we have enough gas to make it back?? For our last day in Viani we decided to take it easy. We played scrabble, and Crystal and I took a walk along the beach, allowing Anne-Marie to enjoy some yoga on the bow. It was very interesting to see the school in the village, where about 60 children attend. Nearly all of them seem to ride to school on a panga boat from somewhere else in the bay. What a different scene from your typical North American yellow school bus! While walking by one house, Crystal and I heard shouts of "Bula, come in!". Not being entirely certain of what was said, we replied "Bula" and kept walking. Moments later a Fijian man appeared at the door and once again urged us to come in for some tea. We accepted and found ourselves in the kitchen of a young couple who teaches at the school. The wife boiled some water for tea on an open fire, while the husband cut thick slices of white bread. As it turned out they had just finished their dinner, which was also buttered white bread with tea. It was very interesting to hear about their lives, difficulties and aspirations. They were incredibly kind and happy for two people who had so little, and shared it eagerly with Crystal and I. We highly recommend Viani Bay as a great spot to view pristine coral and interact with very friendly locals. Thanks for visiting Crystal! We loved having you aboard and look forward to visiting you in your home soon. nice ! she is the one I missed ....ha ha ! have a great trip guys. I going for a canoing ride thinking of you !